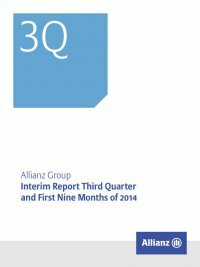 Interim Report Third Quarter and First Nine Months of 2014 Allianz Group16 Property-Casualty BUSINESS segment information € mn three months ended 30 September nine months ended 30 September 2014 2013 2014 2013 Gross premiums written1 11,254 10,650 37,317 36,602 Ceded premiums written (959) (859) (3,122) (3,290) Change in unearned premiums 885 977 (1,904) (1,853) Premiums earned (net) 11,180 10,768 32,291 31,459 Interest and similar income 897 885 2,689 2,704 Operating income from financial assets and liabilities carried at fair value through income (net) 4 (35) 20 (61) Operating realized gains/losses (net) 74 14 129 44 Fee and commission income 347 317 955 915 Other income 7 11 46 29 Operating revenues 12,509 11,960 36,130 35,089 Claims and insurance benefits incurred (net) (7,366) (7,234) (21,179) (21,030) Change in reserves for insurance and investment contracts (net) (168) (107) (428) (318) Interest expenses (20) (9) (49) (31) Operating impairments of investments (net) (4) (2) (10) (9) Investment expenses (88) (88) (232) (233) Acquisition and administrative expenses (net), excluding one-off effect from pension revaluation (3,089) (2,976) (9,037) (8,861) Fee and commission expenses (323) (295) (894) (843) Restructuring charges (5) (11) (6) (13) Other expenses (24) (6) (38) (18) Operating expenses (11,086) (10,725) (31,873) (31,356) Operating profit 1,422 1,235 4,257 3,733 Non-operating items 86 (74) (405) 265 Income before income taxes 1,509 1,161 3,852 3,999 Income taxes (426) (365) (1,155) (1,185) Net income 1,083 796 2,697 2,814 Loss ratio2 in % 65.9 67.2 65.6 66.8 Expense ratio3 in % 27.6 27.6 28.0 28.2 Combined ratio4 in % 93.5 94.8 93.6 95.0 1 For the Property-Casualty business segment, total revenues are measured based upon gross premiums written. 2 Represents claims and insurance benefits incurred (net) divided by premiums earned (net). 3 Represents acquisition and administrative expenses (net), excluding one-off effect from pension revalu- ation, divided by premiums earned (net). 4 Represents the total of acquisition and administrative expenses (net), excluding one-off effect from pension revaluation, and claims and insurance benefits incurred (net) divided by premiums earned (net).